Do you ever overthink a decision? Agonize about it, going back and forth while you anxiously chew your nails or think about eating more chocolate? 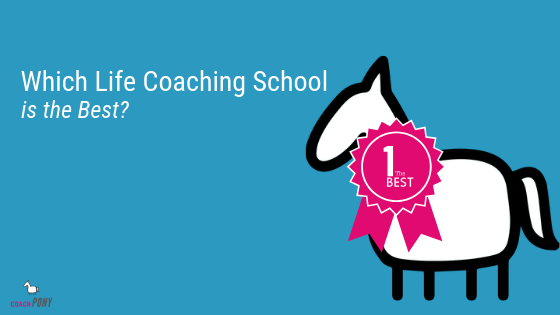 It’s a place to meet up with other entrepreneurs who love coaching, and focus on the business side of what we do. I share things in there every week to help move you along. And as of now, it’s archived. Yep. After much debate I finally pulled the plug. Seems *kind of* crazy, right? I’ve invested some time and money into growing this small-but-mighty group, why would I shut it down? So, if you don’t know about platforms I talk all about them in this helpful free guide on how to make money as a coach (download it here). And for me, Facebook Groups are NOT my main marketing platform. That means that it’s not my preferred method for marketing my business. It doesn’t work best with my style of communication right now. I LOVE it for pure teaching and sharing, which is why all of my premium paid programs have their own Facebook groups in which I love participating. But the free group is different. I set up it up off-handedly several years ago to test out marketing platforms and have some fun (this is why I’m here, to test things out for you!). For the most part, it’s grown organically with little effort from me. Again, not my main platform so I didn’t put time into growing it. 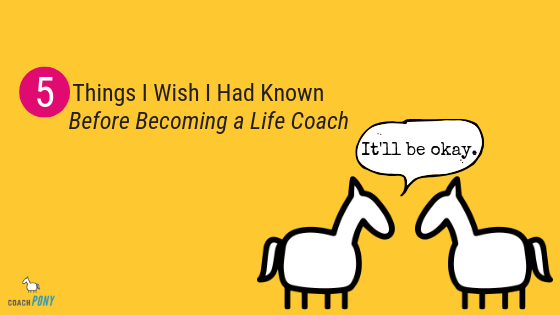 But even so, I found it was causing me anxiety to manage and seeping away my focus from other, much more productive, ways for me to share about Coach Pony and this awesome community. The Pareto Principle, otherwise known as the 80/20 rule, applies to marketing as well as to everything else: 80% of your clients will come from 20% of your marketing efforts. It’s important to figure out what that 20% is, and then expand it. For me right now, it’s not Facebook Groups. Once Facebook has got you on their platform, they want you to stay on it. That means that they want you to see stuff that you like, that will encourage you to dive into a Facebook hole that you emerge from, covered in nacho-cheese dust, many moons later. What that means for me is good and bad. I also want you to be on Facebook if I’m there, as that is a way to reach you and have fun discussions and interactions outside of email or blogging. But it hurts my business if you don’t ever see anything I’ve posted. Or if it costs an arm and a leg to even get in front of your tired eyes. In fact, companies like mine, who aren’t friends with you and therefore aren’t posting photos of our last Thanksgiving together, aren’t going to show up in your newsfeed. Even if you like our page or follow us. If Facebook fills your newsfeed with ads and stuff you aren’t interested in, you won’t spend any time there. If they show you my stuff organically and easily because you choose to follow me, I won’t pay as much to reach you. So, over the last few years Facebook keeps restricting my organic reach, and making me pay more and more and more to even get seen by you. First it happened to fan pages, and now it’s decimating groups. Facebook is NOT showing posts to people (THIS. Is. Why. I. Am. Gritting. My. Teeth.). A year ago, I had tons of posts that had at least 10-30 engagements, likes, comments, etc. I felt reasonably good about that, people were engaged in my group, right? BUT – when I dug into the numbers, I found that those posts had only been seen by 150 people. 15% of our group. UGH. So a post that has engagement still can’t get seen? FRUSTRATING. Then it got worse. I posted content I absolutely knew was helpful, visually interesting, and engaging (this is not my first rodeo) and received no comments or likes. And I realized that Facebook stopped showing most of my posts to anyone, regardless of the post. So now I’ve got a group that won’t show you anything, can’t reach anyone, and has no engagement for the above two reasons. 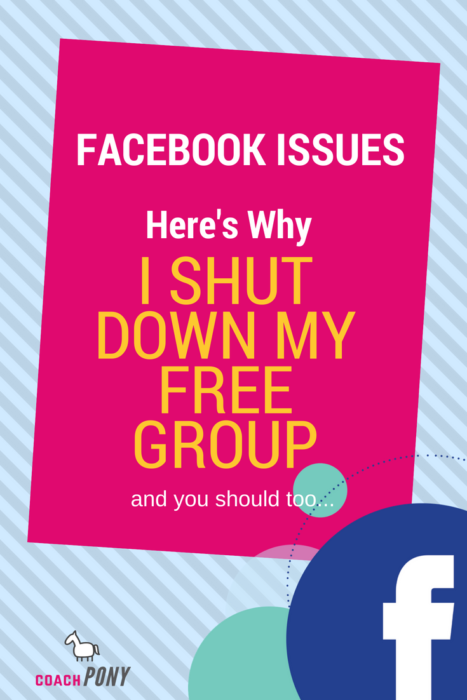 I regularly invite my group to webinars and OF COURSE Facebook will only allow me to invite up to 250 people. If you invite too many people at the same time, it will block your ability to invite anyone. So, for my last webinar I went through the group and patiently invited small groups of folks to join, so as not to trigger Facebook. I tagged people, etc etc. It was as if no one had even seen the invite (I’m pretty sure almost no one saw the invite). And so I turned to messenger within the group. These people were in my group, they’d ask to join, they can leave at any time, so it seems fair that I should be allowed to message them at least once. Keep in mind that they have to still accept the message from me before getting it. So, there’s still a lot of protection built in for my group members, and therefore it should work, right? Listen, 3 years ago Facebook groups were all the rage. You could build a huge one and have tons of organic reach in your group easily. Now, most people are members of upwards of 20 groups (some upwards of 200) and no one is paying attention to any of them. Heck, as a consumer myself I’m not even paying attention to some groups I’ve paid to join, much less my free ones. We just don’t value free stuff the same way we value what we pay for. So, separate from all of the ways in which Facebook has made my life hard, I also think that people are kind of over Facebook, and Facebook groups, for the most part. Sure, some people are having success with them, but it requires a level of commitment (and some luck) and I’m just not interested because…Facebook Groups are not my marketing platform :). Actually, Facebook itself isn’t either, though I still use it to some degree as a secondary marketing platform. By the way: The reason my premium paid groups are so successful, in my mind, is that 1) People have paid to get in, so they want to participate and 2) They are all talking about the same thing, like the steps in my Build a REAL Business program and finally 3) They trust me. They’ve bought into BARB and they trust me and want to play. Here’s the bottom line to sum up why I shut it down for now, and why you might want to think about not starting one either. Facebook groups, and Facebook in general, is not my primary marketing platform, so it’s truly not the right space for me right now. This blog however IS a part of my platform, and I hope you’ll engage with me here. Or, if you love the Facebook with a passion, you can still find our Fanpage here :). 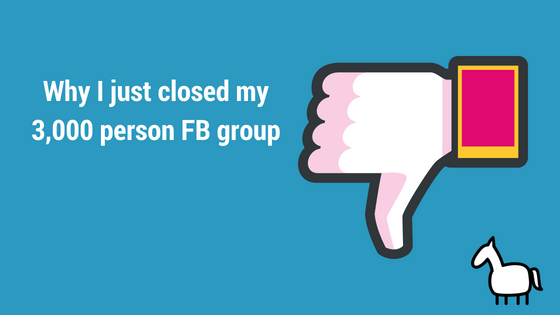 Facebook is making my life hard – groups don’t work the way I need them to work to pay off. Meaning, I create a lot of free content for the group, but no one is seeing it, so it’s not worth my time. Soon we’ll be able to advertise in groups, which is one of the reasons why Facebook has put organic reach in the crapper, so folks like me will start paying…but I’m tired of it. This is not where I want to spend ad dollars right now. I do reserve the right to change my mind :). 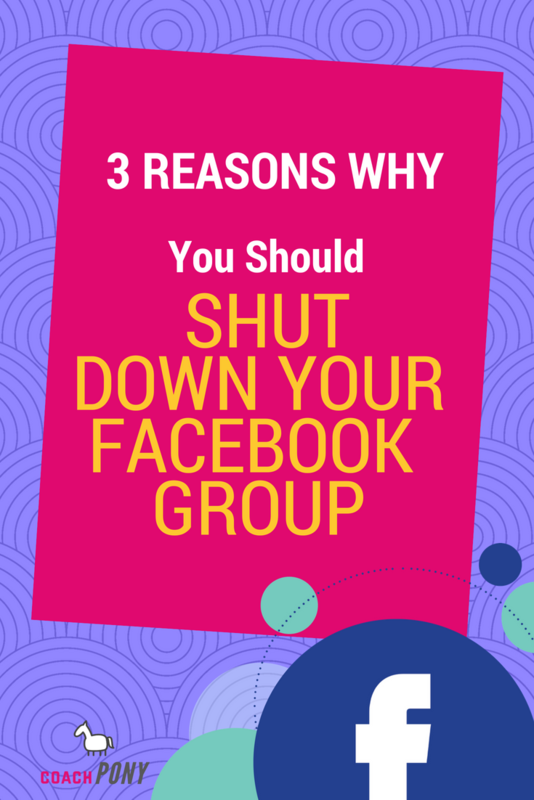 I think you are tired of free Facebook groups and Facebook as well. If feels like most people join a group and immediately check out. Frankly, you and I aren’t using Facebook the way that we used to, and there’s been a lot of backlash, and a lot of fatigue. I don’t think free groups are the way of the future unless something changes – I honestly believe that people engage when they put money on the table, and while free content is important, I’m not sure Facebook is the right vehicle for it in terms of building your business in the short term (I will not speak for the long term here, Facebook is constantly changing :)). If it is, go for it! But also don’t feel bad about saying “no” and doing something else. Still need help with that platform thing I mentioned? Definitely grab this free 26 page fancy-pants guide which tells you EVERYTHING you need to know to get your business up and running, with money in the bank, including how to know which marketing platform is right for you! Grab it here.